Heat oven to 400°F. In medium microwavable bowl, microwave onions and oil uncovered on High 4 to 5 minutes, stirring occasionally, until onion is soft. Divide in half; set aside. In large bowl, mix half of the onion mixture and remaining Meatball ingredients, tossing lightly until thoroughly mixed. Shape mixture into 1 1/2-inch meatballs, using hands or large cookie scoop (60 to 70 meatballs). Place on ungreased 15x10x1-inch pans. Bake 15 to 18 minutes or until browned. Spray 6-quart slow cooker with cooking spray. In slow cooker, mix remaining half of onion mixture and Sauce ingredients. Mix well. 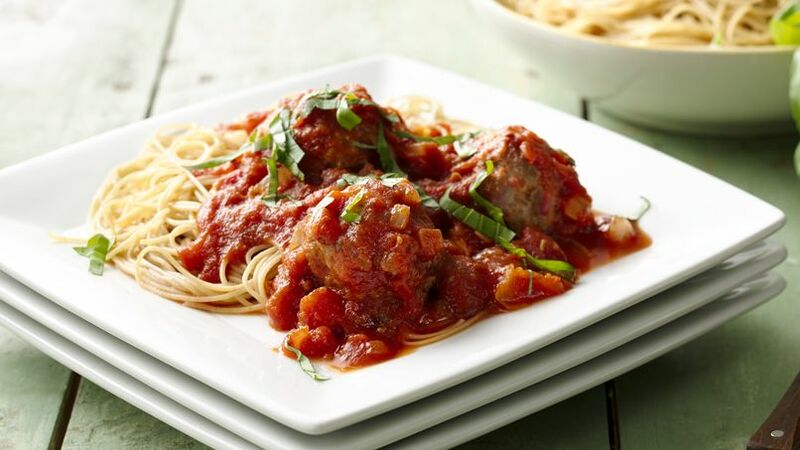 Place meatballs in sauce; gently mix to cover all meatballs in sauce. Cover; cook on Low heat setting 4 to 6 hours or until hot and meatballs are cooked through. Serve over pasta; top with basil. To make ahead, prepare and bake the meatballs the day before. Then add to sauce, and prepare as directed. You may need to cook the dish slightly longer, since you are starting with cold meatballs. Serve leftovers later in the week in a hoagie bun with mozzarella cheese and basil sprinkled over the top. This recipe will serve 12, so feel free to freeze any leftovers up to 1 month in an airtight container for an easy meal down the road. This is family dinner at its best. It is perfect for a sit-down dinner or for those nights when everyone is eating in shifts.